Some Champagnes from Savart was once again released by French-Swedish wine merchant Caviste. Savart is one of the new generation of high-class small producers in Champagne, and has become noted in wider circles in recent years. He is located in Écueil, a premier cru village in the northwestern part of the Montagne de Reims – “La Petite Montagne”. Savart also has vineyards in the neighbouring village, Villers-aux-Nœuds. The Champagnes are Pinot Noir-dominated but very firm and mineral-dominated for their varietal composition. They also have quite a bit of fruit and “substance”, in particular those that feature some oak barrel vinification. In recent years the style of Savart has probably become even slightly better and more accessible when young, compared to the first couple of years when Caviste sold them. Apparently, it was three years ago when I last wrote a blog post about a release from Savart, which was the one in 2015. I previously wrote about the 2014 release here. The three Champagnes tasted are mostly composed of the vintages 2016 and 2015. 2015 is a powerful and ripe vintage that is considered very good, while 2016 is a less powerful vintage. The blend of the two has turned out quite good. 100% Pinot Noir, Brut, dosage 6 g/l. Base vintage 2016, supplemented with 2015 (and possibly reserve wine from another vintage). A young and fresh nose with ripe apples including waxed green and red apples, some bready notes as well as hints of nuts and other developed notes. Dry palate with apples – the same apples as in the nose – good acidity, hints of spices, and a good minerality. Firmer on the palate than the nose indicates, could benefit from some cellaring. Approachable now but may be better next year, if you can keep your hands off it. 88 p.
L’Ouverture is somewhat more fruity and with a bit more body than it was some years ago, but I still think it shows the same fresh apply character as has always been the style of this Champagne. This years’s L’Ouverture is probably a little less powerful and a little less “ready” than last year’s release. However, as always, L’Ouverture is more made to be drunk young than what is the case for L’Accomplie. 80% Pinot Noir and 20% Chardonnay, Brut, dosage 5 g/l, i.e., in reality an Extra Brut. Base vintage 2016, supplemented with 2015. 50% vinified in oak. Nose with ripe red and yellow apples, spice notes, mineral, some developed notes with bread and hints of dried fruit. With time in the glass there is some more impression of oak. Dry on the palate with good concentration, apple, good acidity, minerality, and some spice notes. Reasonably approachable but with a good development potential, 89+ p.
L’Accomplie shows more mineral notes and more complexity than L’Ouverture and shows more classical Pinot Noir Champagne notes. The oak barrel component makes L’Accomplie more “foody”. 80% Pinot Noir (of which about 6-8% red wine) and 20% Chardonnay, Brut, dosage 5 g/l, i.e., in reality an Extra Brut. Base vintage 2016, supplemented with 2015. The red wine is from 2016. Pale pink colour. Very fruity nose with ripe red apples, some citrus, mineral, and discrete flowery notes. The palate is medium bodied(+) with red apples, good acidity, minerality, and kind of Burgundian mouth feel with slighly oily texture which actually makes me think of white Burgundy. Rather young, reasonably approachable now, but could develop more, 89(+) p.
The rosé shows more berry and less bread compared to Ouverture and L’Accomplie, but shows good power on the palate. Some of those who tasted thought that its nose reminded them of red Burgundy. To me, this usually happens to rosé Champagnes when they show more developed notes, so I didn’t “read” the nose in this way. The palate did however give me Burgundian impressions, and in that case more white Burg rather than red Burg. We also got to taste an older bottle of each of the three Champagnes. I might write up something about these later, as well as about the two Savarts from last year’s release that I tasted about a year ago. 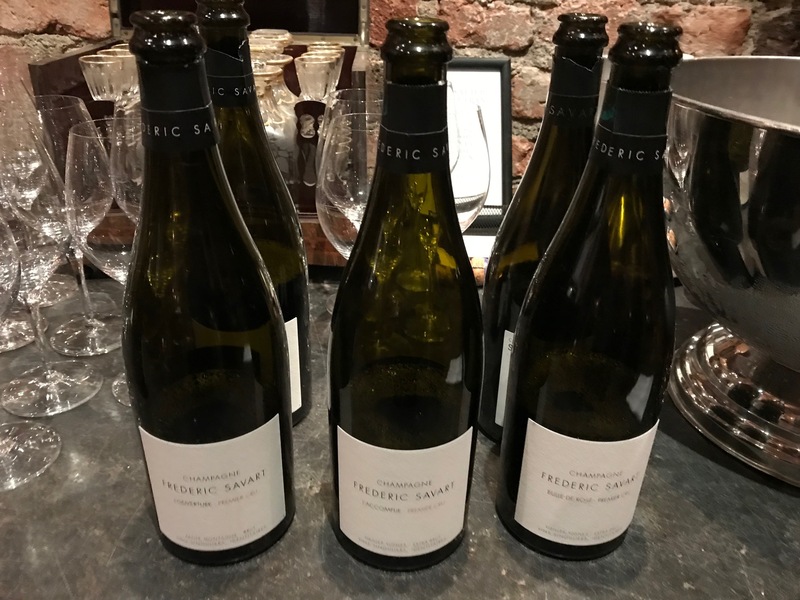 There are also “higher parts” of the Savart range, that are no longer part of Caviste’s regular release (mixed 6-packs of the three cuvées) due to increasing prices and decreasing allocations. L’Année is the regular vintage Champagne. Expression is old vine Pinot Noir from three vineyard sites in Écueil, and is produced both in a white and a rosé version. There are also two vineyard-designated Champagnes. Le Mont Benoît is a 95% Pinot Noir/5% Chardonnay from Villers-aux-Nœuds. Le Mont de Chrétiens is a 100% Chardonnay from Écueil, and has replaced Dame de Cœur, the former prestige Champagne of the Savart range.